Summary: How to help prevent legionella outbreaks: One critical element is the correct cleaning of cooling towers. MELBOURNE: The recent outbreak of Legionnaires’ disease in Melbourne CBD, where 5 cases were identified, highlights the importance of controlling Legionella bacteria in cooling towers. It is very unlikely that the source of the outbreak will be confirmed, as all cooling towers in the suspect area were immediately disinfected to kill off any bacteria. “The source of the outbreak cannot be the main focus. The onus is on the industry to look after cooling towers correctly to help prevent more outbreaks,” says Coolclean Managing Director, Darren Driscoll. For the industry, it is a public safety issue – the emphasis should be on doing everything possible to protect the public from the outset. At present, water treatment is the main focus in relation to managing Legionella; how the cooling tower performs mechanically tends to be overlooked. Insufficient cooling tower mechanical maintenance can lead to higher bacteria levels (Legionella) and increased possibility of outbreaks. “There should be two lines of defence against Legionella: the first line of defence is water treatment; the second line of defence should be mechanical,” says Mr Driscoll. Mechanical components include fill pack, water distribution system, fan drives, air intake louvres and the most important, drift eliminators. 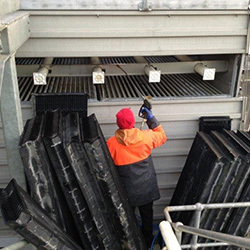 If water treatment fails, drift eliminators are the last line of defence against Legionella, because they prevent bacteria escaping the cooling tower via the force of the fan. Each droplet of ‘drift’ has the potential to hold many Legionella bacteria and can be inhaled by persons within a 2 km radius. Are your drift eliminators being maintained? If so, photographic evidence should be provided by your service provider. It is also important to correctly maintain other mechanical components such as fill pack, the water distribution system, air intake louvres and fan drives, as all these components have an impact on drift loss and on the water treatment program. Immediately on discovering the outbreak, the Health Department investigates and narrows the search to a suspect area. All cooling towers in that area are then disinfected. This approach results in all the cooling towers being rendered safe in the area, giving the Health Department time to investigate the outbreak without placing further people at risk. Combining water treatment together with correct mechanical maintenance provides the best means of Legionella prevention. Solution: Destroy the bacteria with water treatment, and control the spread of Legionella with well-maintained drift eliminators among other cooling tower components. To date, 26 cases of Legionnaires’ disease have been notified from across Victoria in 2017, compared to 21 cases for the same period last year.